Despite the total shambles that marked the 2005 Indy Grand Prix, the Americans have hosted the F1 circus again, even though it needed offers of free tickets (20,000 of them) from Michelin as some form of appeasement. There was also a class action against the promoters in the American courts, but it was rejected. 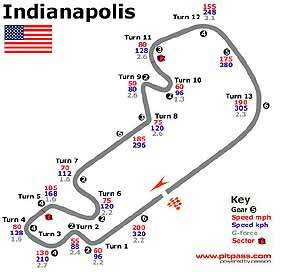 The US GP is held at a special ‘stadium’ circuit built inside the famous ‘Brickyard’ Indy circuit and incorporates one straight and one corner of the American classic. The ‘Indy’ circuit more correctly known as the Indianapolis Motor Speedway (there is also a circuit called Indianapolis Raceway Park) opened in 1909 as a 2.5-mile track paved with bricks. Each of the long straights is 3,300 feet long, the short straights are 660 feet. Each turn is 1320 feet long and banked at 9 degrees and 12 minutes. The track is now surfaced with tarmac and there have been subtle changes made to the turns to slow down cars - or to speed them up when the Indy Racing League took over the Indianapolis 500. The ‘Brickyard’ held its first 500 mile race in 1911 and the Indianapolis 500 is now the world’s oldest continuously run motor race. It is also the richest motor race and the world’s largest single day sports spectacle. Tony George, the President of the Indianapolis Motor Speedway, was almost single-handedly responsible for bringing F1 racing back to the United States. The Indianapolis Motor Speedway had to be brought up to standard in order to host the United States Grand Prix, including a new Paddock area which would allow cars to exit from the garage directly onto Pit Lane. Also, in a major concession to the traditions of F1 racing, the 2000 USGP marked the very first time that a race had been run in reverse (clockwise) direction at the Indianapolis Motor Speedway! Despite the hour, (I believe the race will start at midnight on the Sunday, but check with your local TV feed) I will be at Jameson’s Irish Pub on Soi AR (Sukrudee) next to Nova Park. Join me for a beer or three! The J.D. Power organization revamped its Initial Quality Study to cover both quality of design and quality of production (lack of defects and malfunctions). The Initial Quality Study was based on the responses of almost 64,000 US motorists who have owned 2006 models for 90 days and then answered a survey with more than 200 questions. There were many reasons for the re-assessment this year, as customers have been complaining about difficulties in using their new cars, as well as faults that have become apparent in the way the car was assembled. The traditional method of assessment did not take the design quality into account. “Without considering both quality factors, one might fail to recognize vehicles that are, in fact, excellent in certain ways,” said Ivers. “For example, BMW vehicles have among the fewest defects and malfunctions, along with Toyota. But BMW approaches controls and displays in a way that creates some problems for customers, leading to more design-related problems overall than Toyota incurs. Automakers differ significantly in how they define quality and what parts of the organization they hold accountable for it. Clearing both critical quality hurdles is an accomplishment experienced by only a limited number of brands,” Ivers said. This new way of grading the Initial Quality Study certainly should be an eye-opener or a wake-up call for companies such as BMW and its complex iDrive system. For those unaware of iDrive, BMW managed to produce a system of controls governed by one knob only. The function required is shown on a screen on the dash and you ‘navigate’ around the screen (like a computer drop-down menu) to select the function and then what you want to do with it. When it came to the number of defects per 100 cars, BMW was highly competitive, with only 52, which matched Toyota and was ahead of Honda (57), however when it came to design problems BMW was close to the bottom with 82 problems, the second worst among the 37 brands in the study. Only Land Rover, with 89 design problems, was worse with its controls aggravating its owners. Honestly, I have to agree with the findings expressed by the American drivers. Simple rotary knobs are so much easier than repeatedly punching buttons or scrolling down through multiple choice menus. Grrrrr! On the other side of the coin, Kia, had 72 defects per 100 vehicles when it came to malfunctions, but in the design category it had only 58 problems per 100 vehicles, which as one Australian journalist noted, “indicates Kia owners have an impressive mastery of simple dials, knobs and possibly window winders.” I agree. When it came to overall excellence, Toyota and its Lexus operation ruled, winning 11 of 19 vehicle categories, however Porsche took the top spot overall, Lexus was second and Toyota was fourth. Third was the major upset, taken by Hyundai, which Ivers says “has hit the major league”. The 2006 Initial Quality Study was based on responses from 63,607 purchasers and lessees of new 2006 model-year cars and trucks surveyed after 90 days of ownership. The redesigned IQS is based on a new 217-question battery — up from 135 in previous years — to provide manufacturers with richer information to improve problem determination and drive product improvement. The motoring world seems agog because Mazda has announced it will add an electrically folding roof to the new Mazda MX-5 line-up. Why, I do not know. Not why regarding the roof, which is a great idea, but why the motoring journalists are questioning it. Having had an MX-5 as my daily driver car for three years, removing or installing the hard top was a pain and needed two people, and the rag roof fluttered as they all do at speed. A folding metal roof would have been my first tick-the-box option. Mazda will debut the new roof at the 2006 British International Motor Show (July 18-30). Now in its 17th year of production and third generation of design, the MX-5 is already the top selling sports car of all time and can be expected to get a significant lease of life with the newfound convenience of an electrical hardtop. So what did we learn from the Canadian GP? Well, the first thing we learned was that Michael Schumacher thinks Jacques Villeneuve is a good singer/songwriter! Apparently JV has released his first record and Schumi was asked to comment. It seems that Schumi believes he should stick to singing and forget the rest. There is still no love lost between those two drivers. We also saw the difference between the young inexperienced drivers like Rosberg and old experienced drivers like Michael Schumacher. Juan Pablo Montoya raced wheel to wheel with Schumi and there were no problems, but when Montoya took the apex from Rosberg (the first trick in GoKarting), Rosberg moved over into an apex he no longer had, and ended up in the wall. He has a lot to learn yet. We also saw again just how Alonso wins his world championships. He drives well (much better than his team mate Fisichella for example), the Renault is bullet-proof, and the pit stops go flawlessly. That is their winning combination. Now compare that to the other ‘young charger’ Raikkonen. I believe that the Finn is ultimately the faster driver, but the McLaren Mercedes is far from being reliable and the pit stops must be a period of gut-gnawing anxiety for the driver. Two botched pit stops out of two in Canada. One apparently caused by a dragging clutch causing the engine to stall, and the other with the wheel not seating properly. And this is from a team that is supposedly one of the best in the world. Ron Dennis must be tearing (what’s left of) his hair out. Who is the best Brit out there? I think it is time that the native UK press stopped holding Jenson Button up as the UK’s great white hope. After more than 100 starts, he now has an excuse book that runs to several pages, but I question whether Button actually is of the stuff that champions are made. Currently, ‘old timer’ David Coulthard is certainly showing Button the way, and in Canada, to come from last grid slot to actually pass Button, on the track – not in the pits, to score the final championship point was a superb drive. Coulthard may be the second oldest driver out there, but he is certainly out-driving the UK’s great white hope. We also learned that no matter how many championships your team has under its belt, it can still make some hopeless decisions. WilliamsF1 admitting they chose the wrong tyres for Webber’s car, making it almost undriveable in the race. You must also not lose sight of the fact that the team members who make these decisions are paid mega-dollars for their experience and canny know-how. Sir Frank will be asking questions this week, I am sure. We also saw that Schumi never gives up, and it was because of this he was close enough to Raikkonen to take advantage of the Finn’s slip-up at the end of the race and secure second place on the podium for himself. If Schumacher had been in ‘touring’ mode he would have only been third. The other Schumacher ended up being a mobile chicane all day. It was put down to a wrong tyre choice (similar to WilliamsF1), and his team should have really pulled him in about 40 laps before they did. An embarrassing display for Toyota, whose head office will not be pleased. So we head to the US GP this weekend. 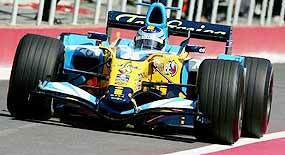 Currently, Alonso has to be favorite, but as always (as we saw in Canada), never discount Michael Schumacher! Last week I asked who was it that had the rear-mounted fuel tank on his Cadillac armor-plated? It was none other than everyone’s favorite crim, Al Capone! So to this week. In 1919 41 percent of the registrations in the UK were a foreign make. Which one was it?